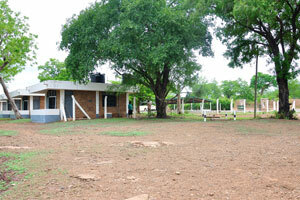 Mole Motel is an inexpensive accommodation for the tourists in the park. 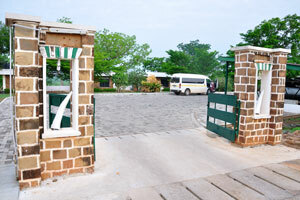 These gates lead to the entrance of ticket office. 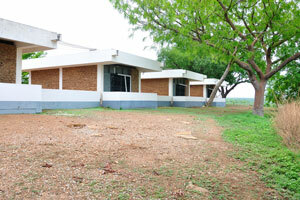 The ticket office of the park. 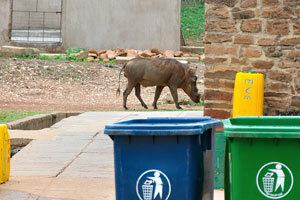 The common warthog “Phacochoerus africanus”. 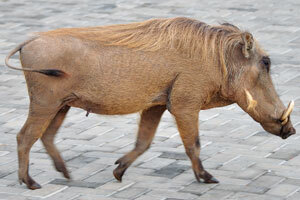 The common warthog is a wild member of the pig family found in grassland, savanna and woodland in sub-Saharan Africa. 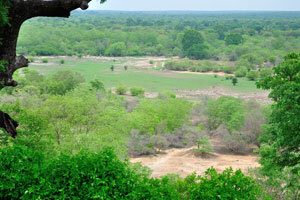 The map of Mole National Park. 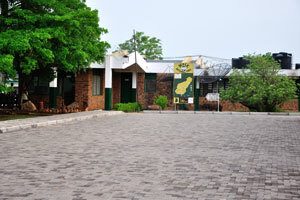 The map of Mole National Park is located at the entrance to reception. 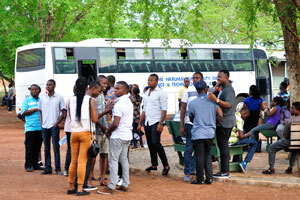 Buses with tourists have arrived from the Kwame Nkrumah University of Science and Technology (Kumasi). The pointer with a direction to the Mole information center. 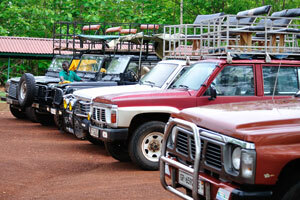 Jeeps are ready for the safari. 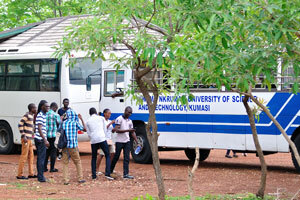 Tourists have arrived from the Kumasi University of Science and Technology. 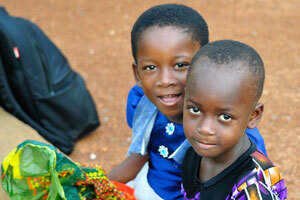 Two cute little African girls are at the entrance of park. 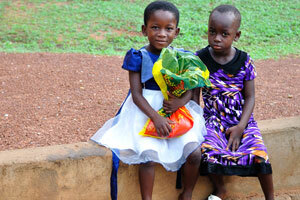 The cute little African girl whispers something to girlfriend. 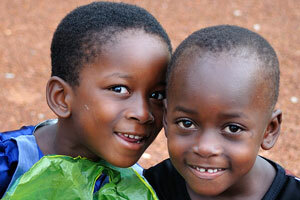 Little African girls have amusing faces. 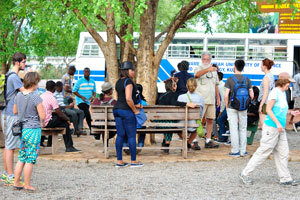 Tourists are ready to take part in safari. 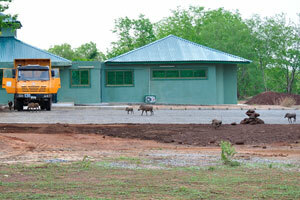 There are many tourists today, so one more jeep is arriving for safari. 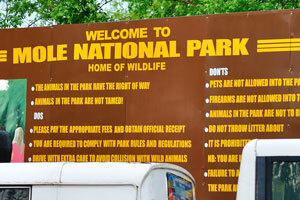 Welcome to the home of wildlife. 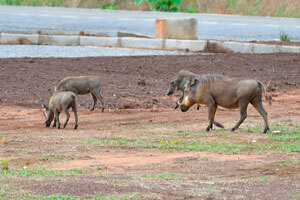 Common warthogs live in groups called sounders. 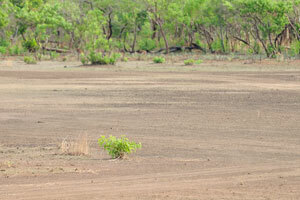 Safari jeeps are on the parking early in the morning. 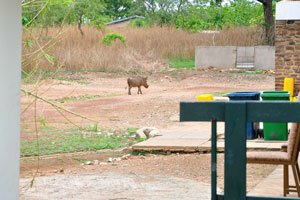 Funny warthogs wander everywhere in great quantities. 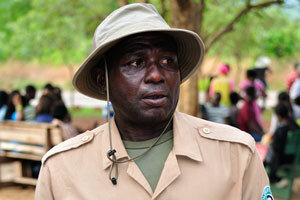 One of the park's employees gives us instructions before the safari. 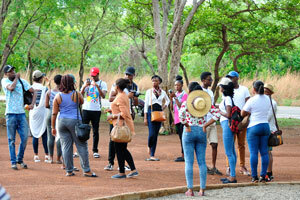 These African young people have arrived here from Kumasi for safari. 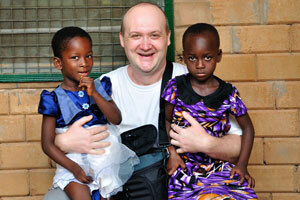 Two cute little African girls are sitting on my knees. 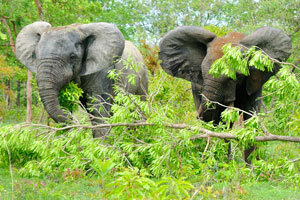 Two cute little African girls are fooling around near the place where safari starts. 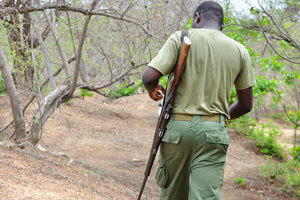 An accompanying wildlife guard has a rifle just in case. 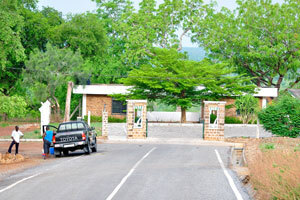 The paved road ends just before the gates of the park's reception. 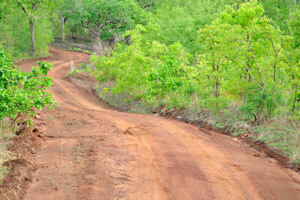 If you ever will drive to the park, you will use this comfortable and smooth paved road. 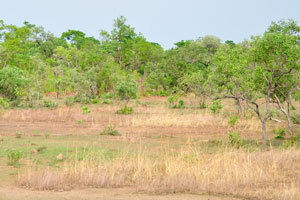 We have just started our safari, the view of the place where strange wooden constructions are located. 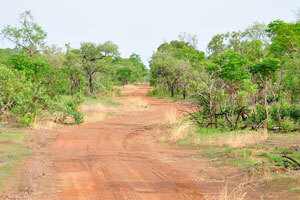 In the beginning of safari the road is paved. 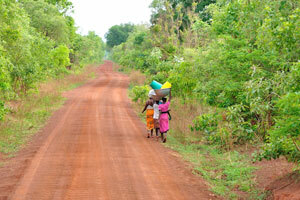 Three women are on the road. 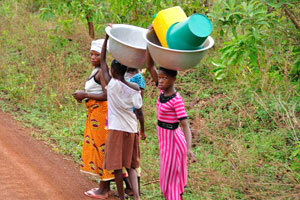 Three women carry the basins on the heads. Local women carry the huge bowls on the heads. 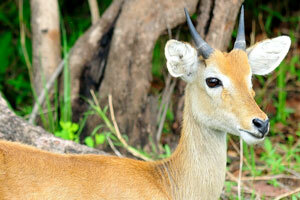 The kob is an antelope found across sub-Saharan Africa from Senegal to South Sudan. 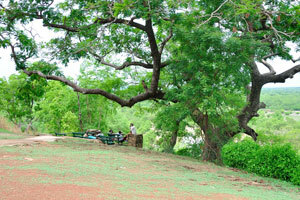 Lush greenery of the park. 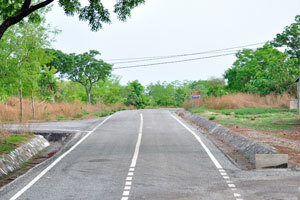 The road of brick color goes through the park. 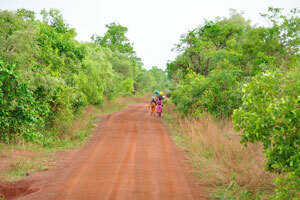 The road of brick color. 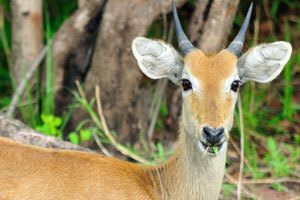 Kob antelopes are found in wet areas, where they eat grasses. 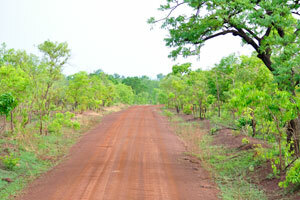 This road could be quite dangerous in the time of raining. 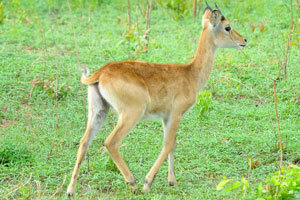 A calf of the Kob antelope. 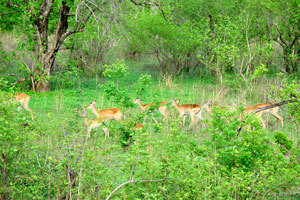 Kob are diurnal, but inactive during the heat of the day. 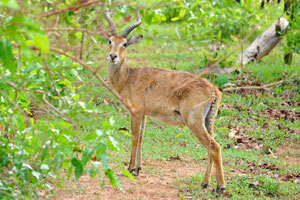 Kob antelope requires fresh graze and drinks daily. 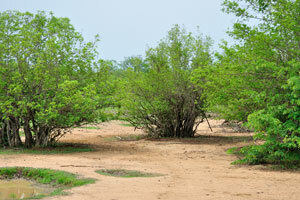 Kob gather on and move from one pasture to another, coinciding with seasonal changes. 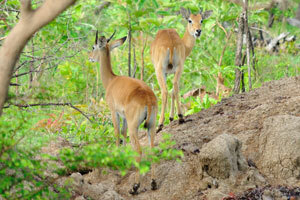 Since it is dependent on water, the kob antelopes do not wander far into arid areas. 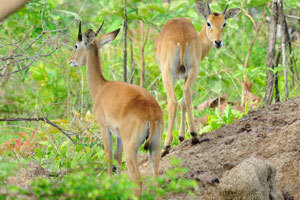 Kob antelopes live in groups of either females and calves or just males. 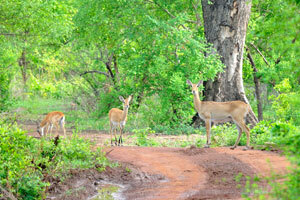 Kob antelopes are on the road. 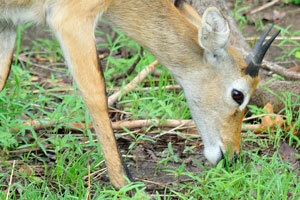 A calf of the Kob antelope is eating the grass. 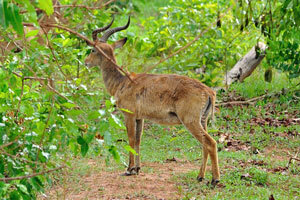 Forelegs of Kob antelope are black at the front. 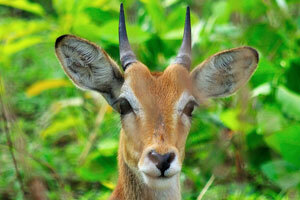 The pelage of the kob is typically golden to reddish-brown overall, but with the eye ring and inner ear being white. 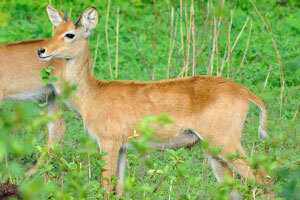 A calf of the “Kobus kob” antelope. 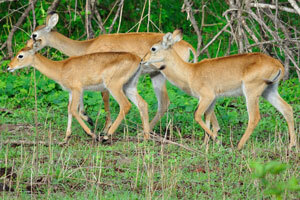 Kob antelopes have few strong social bonds, but females can live in herds numbering in the thousands. 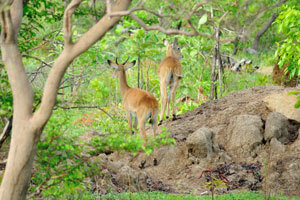 A herd of the “Kobus kob” antelope. 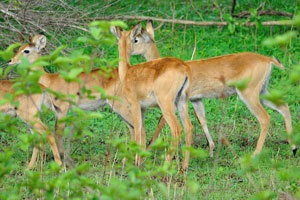 Calves of the “Kobus kob” antelope. 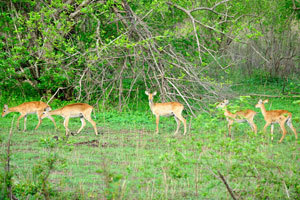 A herd of kob antelope runs through the park. 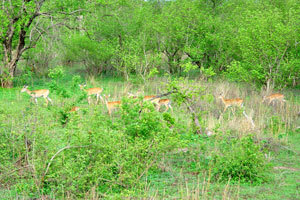 A herd of kob antelope grazes on the pasture. 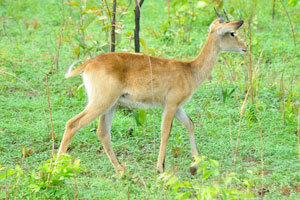 Three young kob antelopes have a distinctive sign of black color at the front of the forelegs. 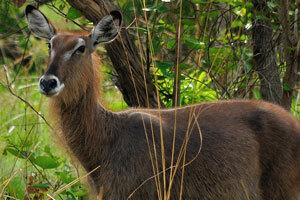 The waterbuck “Kobus ellipsiprymnus” is a large antelope found widely in sub-Saharan Africa. 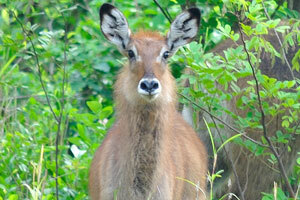 The waterbuck antelopes are gazing at me. 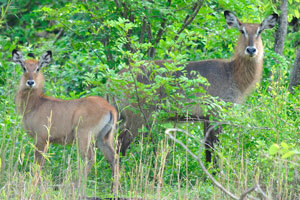 Waterbuck inhabit scrub and savanna areas alongside rivers, lakes and valleys. 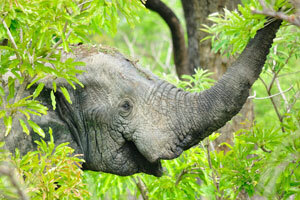 Our joy knew no bounds when we saw the first elephant. 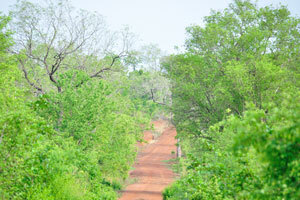 The road goes through a forest. 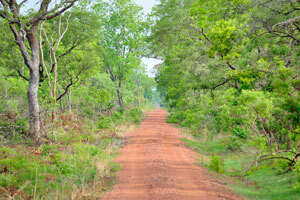 The smooth orange road goes through a fabulous green forest. 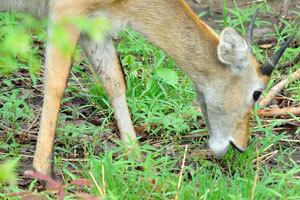 A calf of kob antelope species is feeding with milk from its mother. 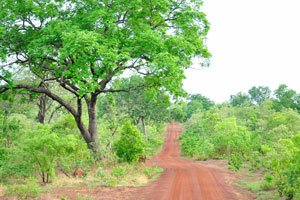 Black trunks of trees make the appearance of green forest even more fabulous. 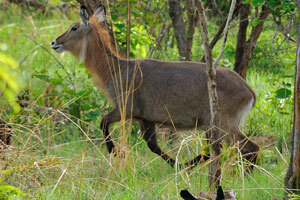 The defassa waterbuck is a large antelope with long, shaggy hair and a brown-gray coat. 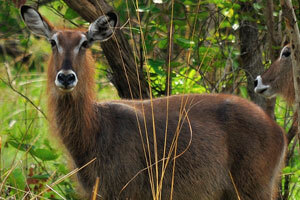 The defassa waterbuck has large, rounded ears and white patches above the eyes, and around the nose, mouth and throat. 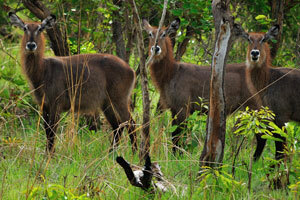 Over 60 percent of the defassa waterbuck populations thrive in protected areas. 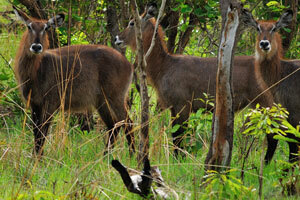 Three mature representatives of the defassa waterbuck species are posing for me. 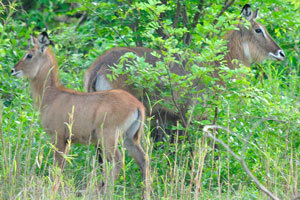 The white rump patch on the rump of the defassa waterbuck can be clearly seen. 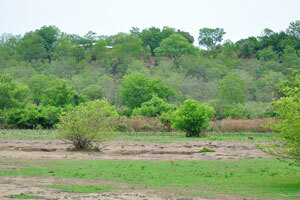 Green, brown and black are the dominant colors in the park. 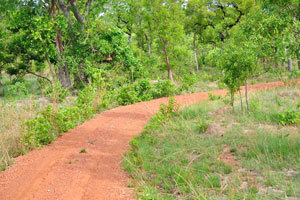 A meandering road is in the park. 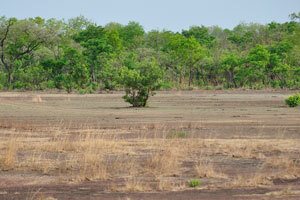 Wide open spaces are in the park. 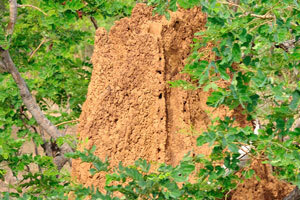 Termitary is in the park. 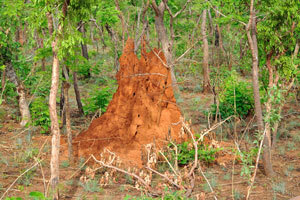 Red-orange termitary is in the park. 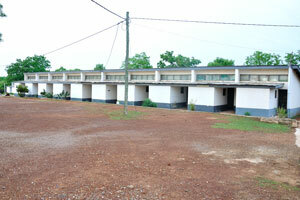 One-storey buildings are in the park. 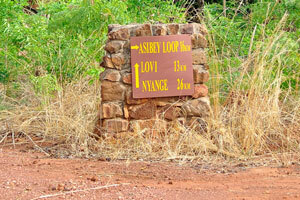 This pointer shows three directions to the Asibey loop (16 km), Lovi (13 km) and Nyange (26 km). 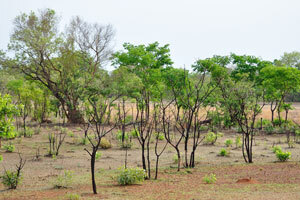 Black trunks of the low leafless trees are in the park. 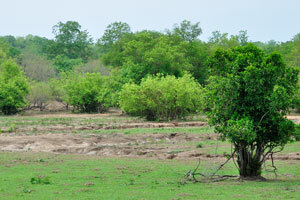 One of the trees is in approximation. 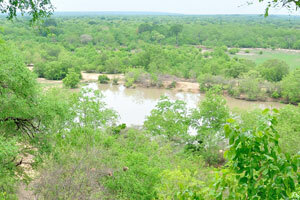 Mole National Park is the largest wildlife sanctuary in Ghana. 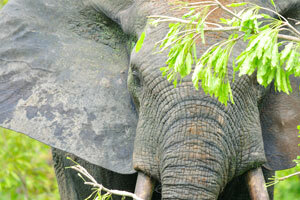 This park is home to a wide variety of animals and birds, including some very rare species that are seldom encountered elsewhere in Africa. 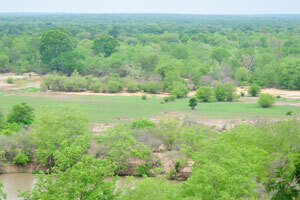 The park encompasses about 4800 sq km of mainly undulating landscape featuring savannah plains and forested areas. 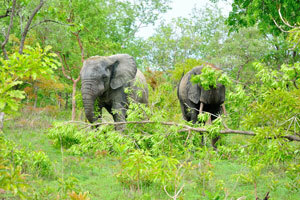 The most comfortable time to visit the park is during the dry months from November to April. 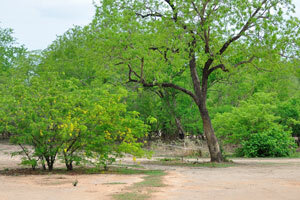 The rainy season, March to November is, however, the best time for bird watchers to visit. 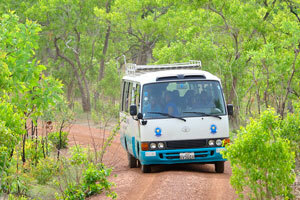 The bus with tourists is on our road. 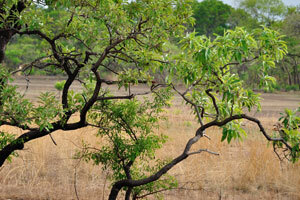 Bird Watching is wonderful in the park and you can expect to be crossing off many species from your check-list. 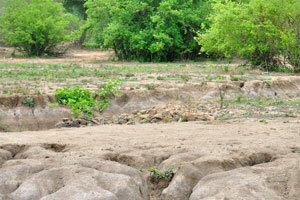 The entire park is an important water-shed for the Volta River. 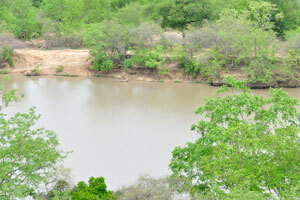 This hotel occupies a stunning location at the top of the escarpment with a wonderful viewing platform overlooking the water hole. 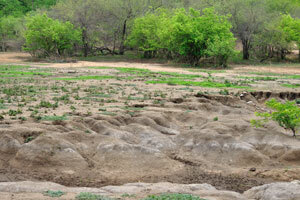 A very rewarding pastime in the park is to spend some time just watching the comings and goings at the waterhole. 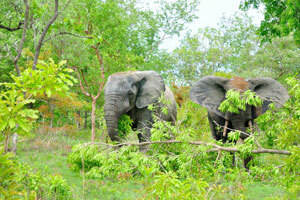 There are about 8000 elephants in the park. 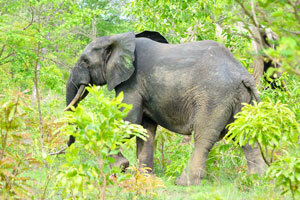 One of the highlights of a visit is the chance to track elephants on foot. 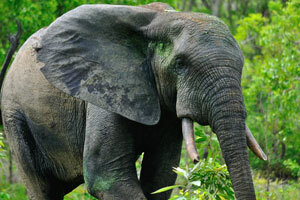 Elephants of Mole have become habituated to humans and are quite unique in allowing visitors to approach them fairly closely. 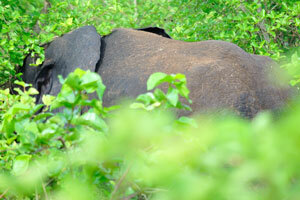 Sometimes elephants can be totally at ease with the tourists and staff. 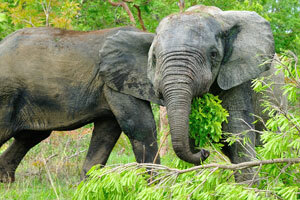 Do remember that elephants will always remain wild animals. 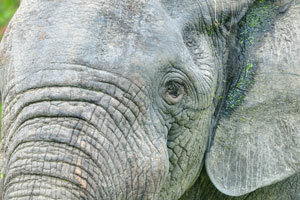 The head of an elephant. 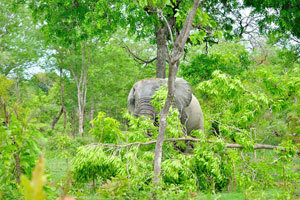 An elephant has torn off a branch of a tree. 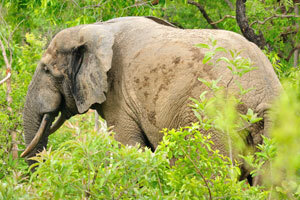 An elephant is waving with its tail as a funny piglet. 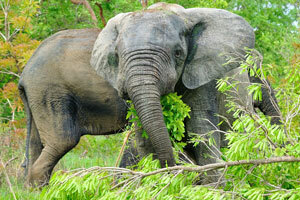 The park is home to over 93 mammal species, and the large mammals of the park include an elephant population, hippos, buffaloes and warthogs. 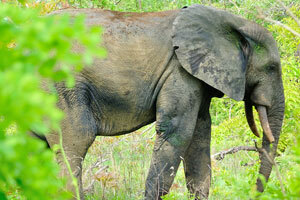 Among the elephants found in the park there are some relatively “tame” individuals. 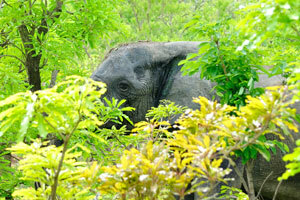 The elephants have generally become used to visitors. 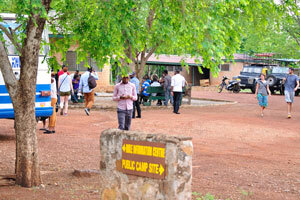 There are 33 camps and 500 km of viewing road in the park. 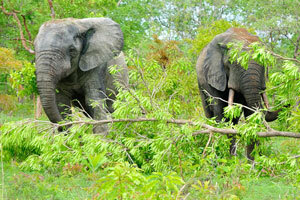 Tourists are photographing elephants from the close distance. 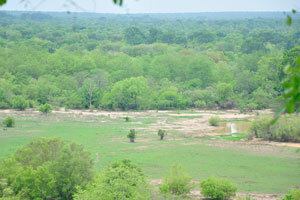 The plentiful water supply during the rainy season means that the park supports over 90 species of mammals. 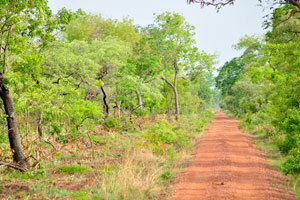 The very best way to enjoy the charms of Mole National Park is to set off to explore on foot, accompanied by an armed ranger to keep you safe. 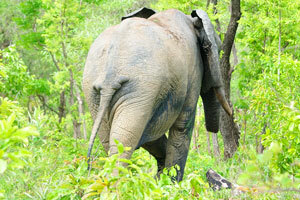 An elephant has raised its trunk. 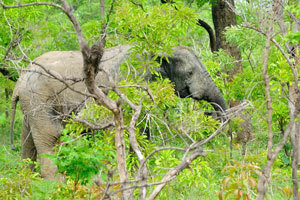 Getting closer to the remarkable elephants on foot is a major thrill that will remain with you forever. 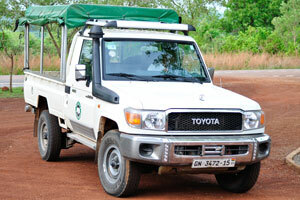 Your guide will be able to take you to the best places to see the varied wildlife of the park. 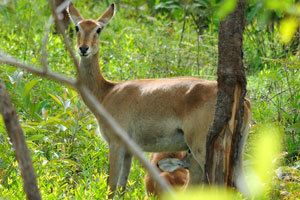 90 mammalian species of the park are including elephant, buffalo, roan, kob, hartebeest, waterbuck, reedbuck and other antelopes. 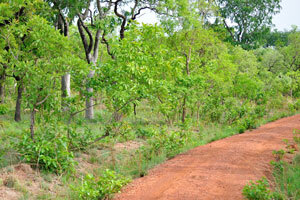 There are 2 guided walks per day: one is early in the morning and the second one is around 3.30 pm. 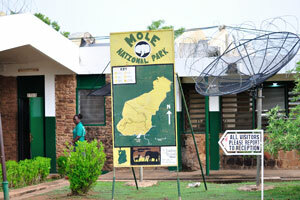 The largest, oldest and most developed park, Mole began in 1957 as a game reserve. 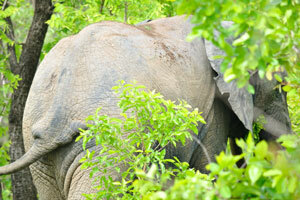 The elephant just a moment before it will make a mock charge on me, because I am the intruder. 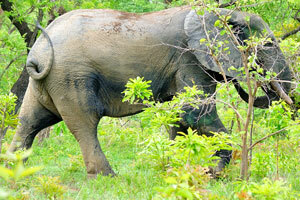 This elephant does not like intruders like me. 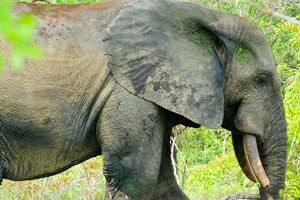 This elephant rushed on me literally, fortunately it was just a mock charge. 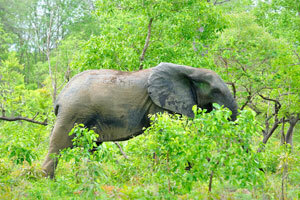 A mock charge made by this elephant was recorded on the video by my companion. 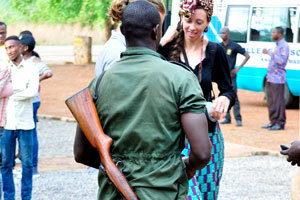 This armed ranger accompanied us in the park. 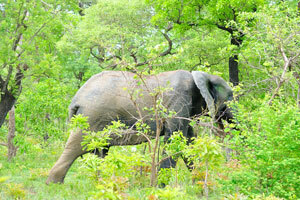 Elephants here are not starving, just imagine there are 734 species of flowering plants in the park. 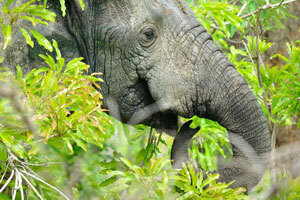 Two elephants are eating the leaves from the trees. 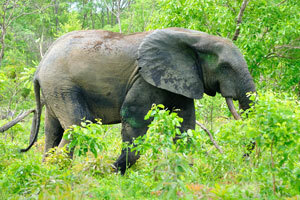 Forest elephants can be found here in Ghana but unlike in many East African countries the safari is not too common here. 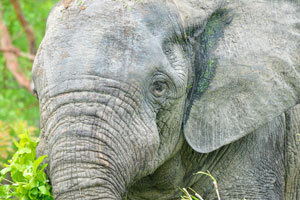 Elephants are the unofficial symbol of the park. 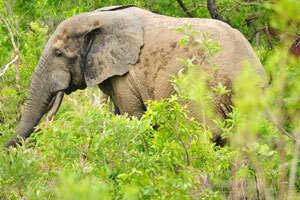 African elephants, kob antelopes, buffalos, baboons and warthogs can be seen on this safari. 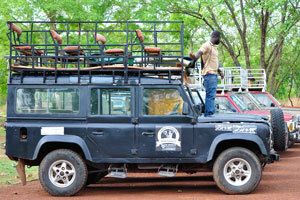 This park organises walking and driving safaris. 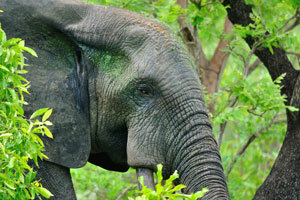 The safari is wonderful and sightings of elephants are common from December to April. 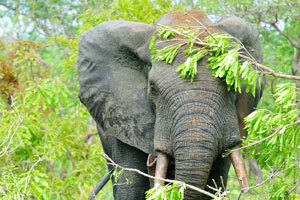 The head and the trunk of an elephant. 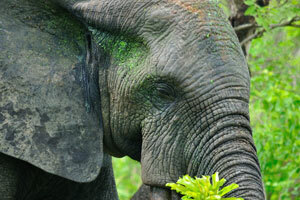 A soil and a grass are on the top surface of elephant's head. 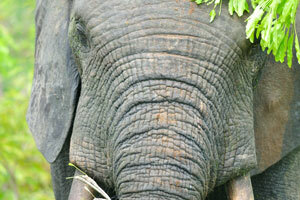 The huge ears of an African elephant. 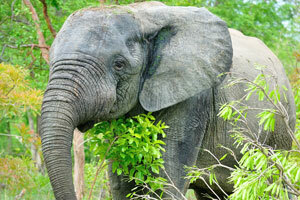 This elephant safari is a must see destination for every tourist. 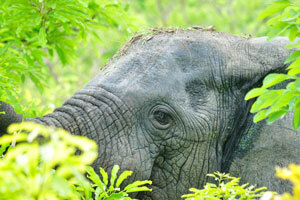 Elephants roam unmolested in the park and its not uncommon to be just ten feet away or above an elephant with massive tusks. 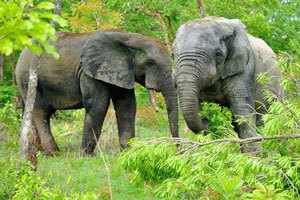 These two African elephants are the luxurious creatures. 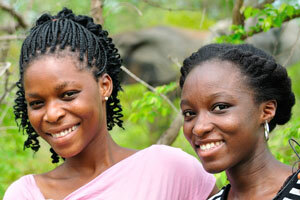 Two beautiful Ghanaian girls are on the background of an elephant. 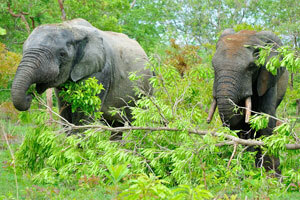 The advantage gained by visitors of these friendly elephants are the close photographs they can take of them. 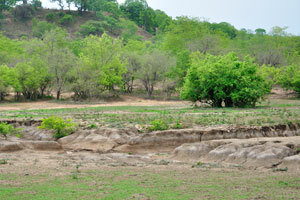 The southern boundary of the park is formed by the Koukori escarpment. 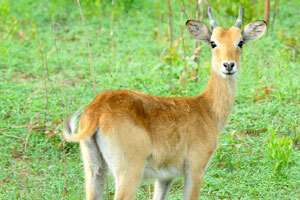 The symbol of the park is the roan antelope. 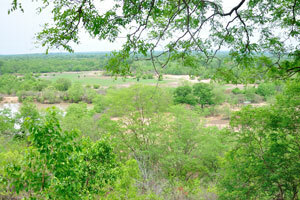 Previously the game reserve, it was upgraded into a National Park in 1964. 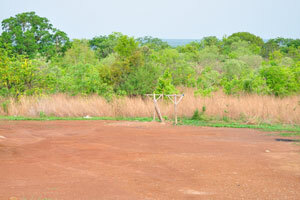 If you do not have your own vehicle, you can rent it here in the park. 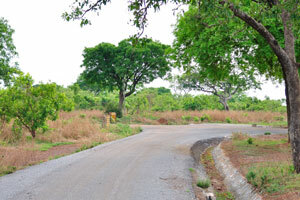 The ground of the park. 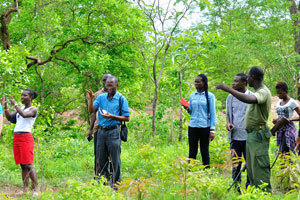 The park is an important study area for scientists. 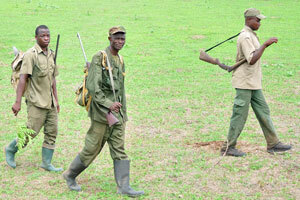 Nowadays, the fauna of the park is guarded by professional rangers. 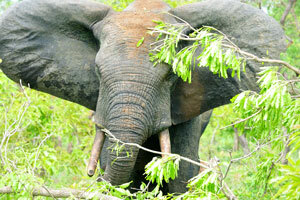 The poachers are at real risk to be put under arrest. 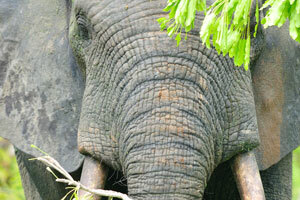 For example, the poacher will be sentenced to 15 years in jail for killing even one elephant. 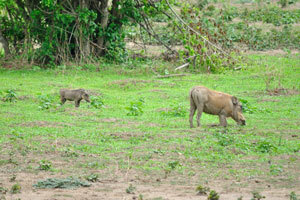 The common warthog is the only pig species that has adapted to grazing and savanna habitats. 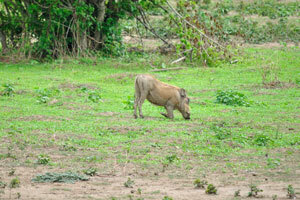 The mature warthog is grazing with the piglet. 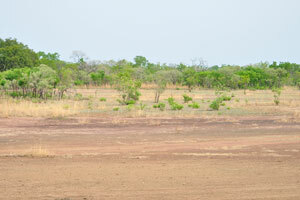 Three rangers are walking across the field. 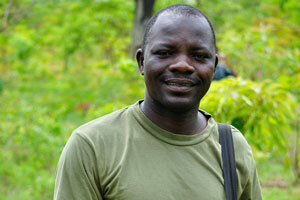 One of the rangers is widely smiling. 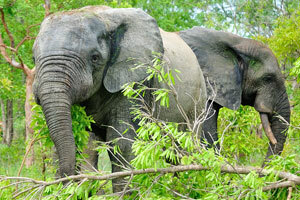 Mole National Park offers the cheapest safari in Africa. 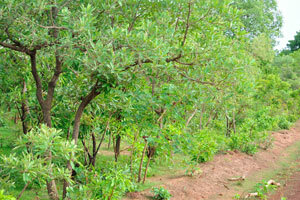 Recently, honey made from flowers in the Mole National Forest has become the region's first fair-trade commodity. 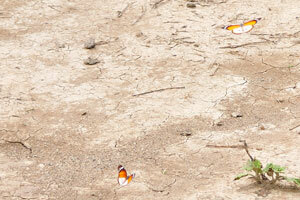 Colorful butterflies are in the park. Butterflies are flying in the air. 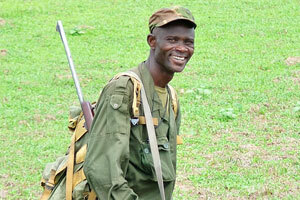 This man is a guide, he has to protect us on the safari. 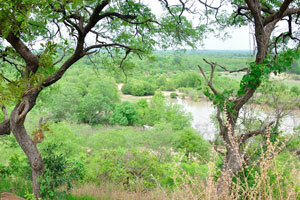 In fact numerous rivers originate in the park, criss-crossing the area before they eventually drain into the White Volta River. 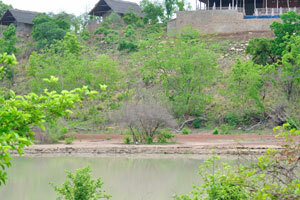 Most visitors spend their non-walking hours observing the activities near the river. 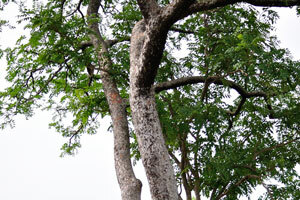 Tree species of the park include Burkea africana, Isoberlinia doka, and Terminalia macroptera. 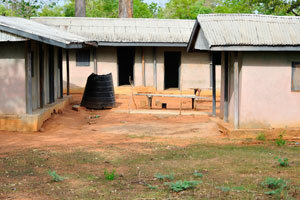 The outbuildings of the park. 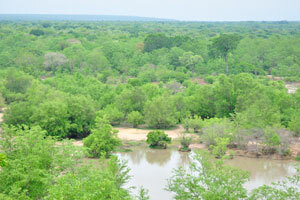 Visitors and guests are privileged to see a variety of wildlife from this escarpment. 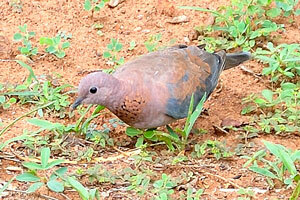 A brown pigeon is in the park. 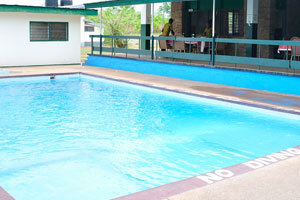 An outdoor pool is an awesome place to relax. 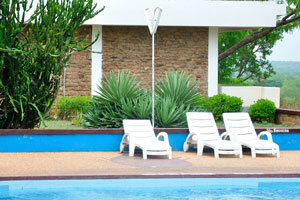 A fabulous pool gives an opportunity to swim, sunbathe and enjoy the breathtaking views of surrounding nature. 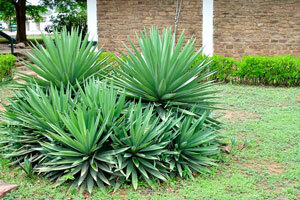 Exotic plants decorate an area around the pool. 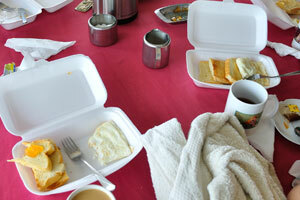 We had a tasty breakfast in the shade near the pool. 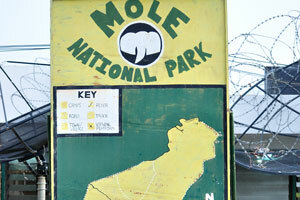 The only non-camping accommodation in the park is the Mole Motel. 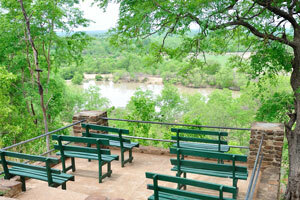 This awesome viewing platform lets you enjoy the views of the river. 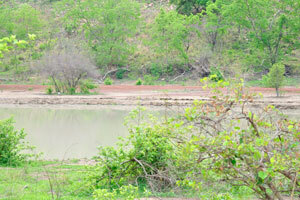 Sometimes thirsty animals come to a river flowing near the motel to drink and bathe. Mole Motel provides a very welcome swimming pool. 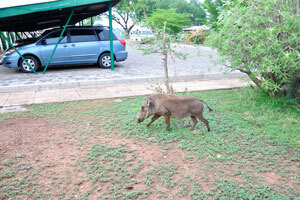 Warthog is wandering near the pool. 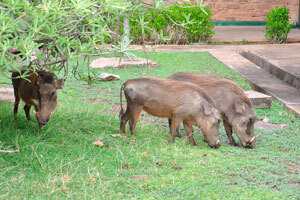 Warthogs could be seen often on the territory of the hotel. 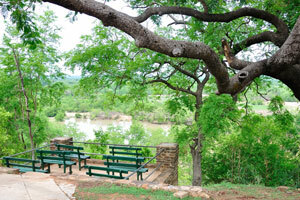 This viewing platform suggests the amazing views for all visitors. 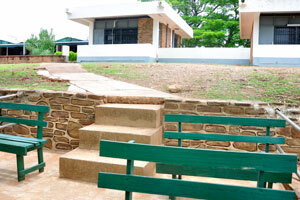 Six comfortable benches are mounted on the viewing platform. 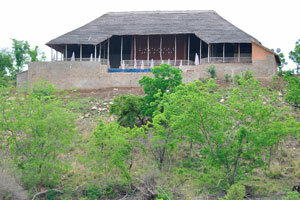 A group of cottages with a delightful view on the river. 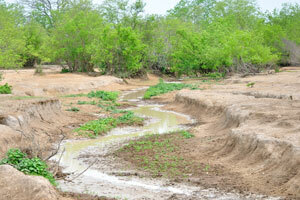 The river is flowing through the park. 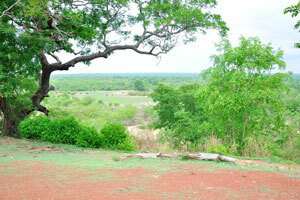 An amazing landscape opens from the escarpment. 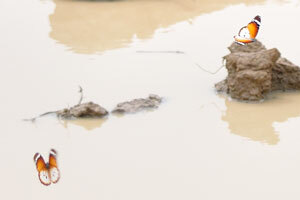 Sometimes, the animals come to the river in this place. 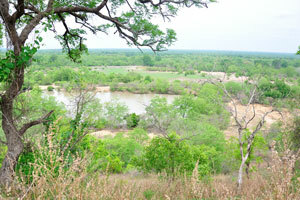 A bird's-eye view on the park. 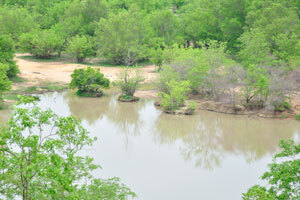 A pathway from the viewing platform to the pool. 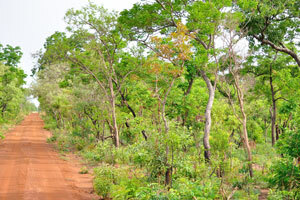 Mole is one of seven National Parks in Ghana. 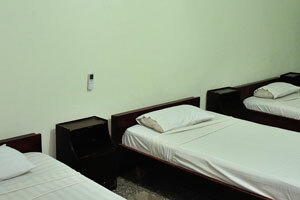 Mole Motel provides basic but clean rooms with comfortable beds.